Packing differences between Muslims and non-Muslims are not many; after all we are all great adventurers and travelers. We worry about the same things, we share the same excitement that travel ignites in all of us. However, because Islam is a way of life, covering every aspect of our daily routine, even when traveling, it just makes travel that bit more special. We don’t have to pack a load more but these simple tips can really make a huge difference during your travels. The most important thing is to make your trip as enjoyable and relaxing as possible. One of my favorite travel accessories that always goes in my bag while packing is my prayer mat. Having my own mat makes traveling so much easier. Gone is the worry about where I will find a clean place to pray, or feeling uncomfortable. Easy to carry, very portable, and a great floor mat if you want to sit and rest during your sightseeing trip. I have used my prayer mat in airport lounges, shopping malls and even the coach station while waiting for my bus to arrive for my next destination. Purchase yours in any Islamic shop or online; an inexpensive accessory every Muslim traveller should have. 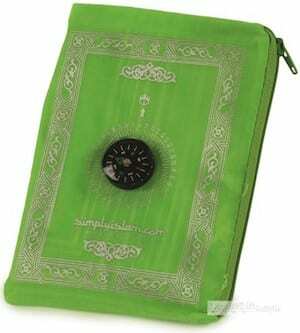 This one, from Simply Islam, is foldable, and has a handy built in compass. One of the things Muslim women stress out about the most is what they will wear and the added difficulty of coordinating the hijab (headscarves) with each outfit. As Muslim women we cover our bodies fully so we always carry a few more layers of clothing than most of the rest of the female population. One of the things I always struggle with is managing to bring the correct outfit, and the long sleeve shirts to cover, plus the right the hijab to match. The best trick I have used when packing is to decide on a color scheme. For example if my clothes are varying tones of grey, blue, and black I can pack a few long sleeve tops that I can wear more than once because they are in the same shades, and they coordinate with every other outfit. They never look out of place. Then, the hijab can brighten up the outfits with a splash of color. This way I can pack several days worth of outfits in a small carry on bag and never feel that I have nothing to wear. If you travel for longer, you can always wash your clothes in your hotel room. Check out this guide to packing light without revamping your wardrobe. 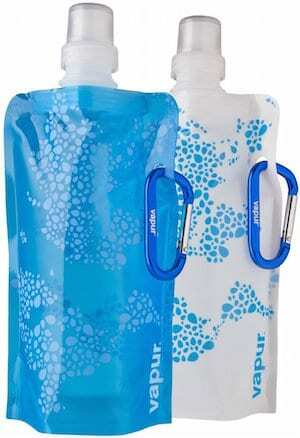 Flat water bottles make a Muslim traveler’s life so much easier. Since we pray five times a day we need to use water to make ablution. Sometimes when traveling finding a bathroom might not be the easiest thing, they might be dirty, or perhaps you just won’t feel like splashing water around. It happens and it is embarrassing, I have had my fair share of “what is she doing” looks as I’ve prepared to pray. These flat, folded, bottles are extremely practical. They fold into my bag without taking too much space and they can also save money while traveling because they can be filled whenever needed. It is a perfect small item that I always have in my bag. Another very important aspect that Muslim travelers struggle with is the direction to which we should pray. I have numerous stories of going in circles in my room using an app on my phone that promised to show me the right prayer direction, only for it to change every time I moved it! . For those who don’t know, Muslims pray towards the Kabah which is located in Saudi Arabia. So, every day, five times a day we must find the direction of the Kabah from our current location. In much of the Muslim world there will be an arrow painted on the ceiling of hotel rooms to point the way, not so in other countries. After all of my struggles with the modern prayer direction apps, I’ve returned to the basics. I bought myself a compact compass which I now pack every time I travel. This saves me a ton of time, is much more reliable than any of the apps, and less frustrating than going in circles in a hotel room. The best way to use a compass is to download the coordinates for the city you will be traveling to and then just make sure you check them in the compass. It is that simple, saving me time and hassle. No matter where I am I can always find the correct direction to pray. Most Muslim women who do not wear the black traditional long dress, called an abaya, overlook this one. Many times I have left traveling only to realize during my morning prayer that I have nothing suitable to wear in order to pray. This means that I actually have to get dressed. During prayer we still have to cover our body fully including our heads. If I pack pyjamas that are not long enough and I don’t have my prayer dress then the only option is to actually wear my normal clothes to pray.This is not the best option, especially since most of us are half asleep due to the fact that the first prayer is just before sunrise. Prayer dresses are one piece clothing items that can be thrown on and you’re ready to pray within seconds. A prayer dress is also great if you need to open the door for room service, in case of emergencies, or just to cover up quickly to pop into a room next door. Next time before you leave home make sure you pack a prayer dress. They don’t take up much space, they are so comfy, and versatile. If you don’t have a prayer dress, this is where I buy them online.